Joe Waldherr is on a mission—to map Saskatchewan’s incredible ATVing opportunities. Less than a year ago, the 37-year-old native of Saskatoon started his own blog and Facebook page called Sask Trail Riders. Using the EveryTrail smartphone app, he started documenting his adventures and then sharing the trip details online with other ATVers who, like him, were looking for new areas to ride. There’s more to Saskatchewan, you see, than wheat fields. The province is actually covered in lakes, river valleys, forests and even sand dunes, and if you know where to look, you can get lost for days in these hidden gems. One of these gems, according to Waldherr, is the Nisbet Provincial Forest. Located about an hour north of Saskatoon, Nisbet Provincial Forest is a protected area of mixed wood forest that is surrounded by aspen parkland. In the winter, the trails are enjoyed by snowmobilers, but when the snow melts, ATVers and other outdoor enthusiasts can take advantage of the area's diverse terrain. Waldherr has some of the trails in the Nisbet Forest mapped out on his blog, and this year, he wants to add more. Another of Waldherr’s top riding picks is the Fort á la Corne Provincial Forest, which is east of the city of Prince Albert. Much like the Nisbet Forest, Fort á la Corne is home to large stands of aspen and Jack pine, as well as abundant wildlife and hundreds of miles of sand and dirt trails. When the snow is gone, Waldherr usually begins his riding season at the Otopasso Trails. Located 20 minutes south of Saskatoon on 150 acres of privately owned pastureland, the Otopasso Trails offer a wide variety of riding opportunities—including terrain that is similar to California’s sand dunes. And according to Waldherr, there are some steep hills there that are sure your get your heart pumping and your tires spinning. The trails are maintained by the Track ’N’ Trail Saskatoon Motocross Club, and in the middle of them are the club’s three motocross tracks. The main track is billed as one of Canada’s finest all-sand tracks. Otopasso is special for Waldherr because it was the first place he went ATVing. 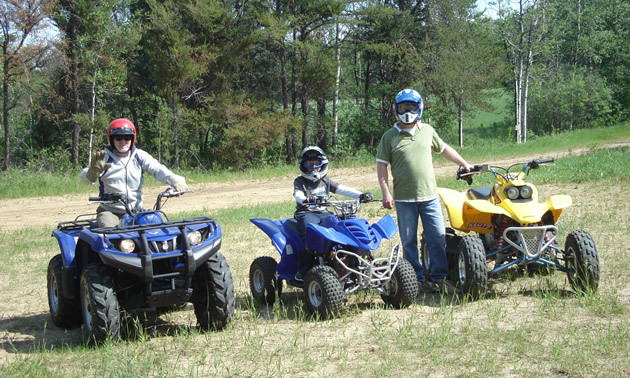 Last summer, he was able to share the ATVing experience for the first time with his oldest daughter, Isaiah, who loved every minute of it. This year, she will have her own machine, a Yamaha Raptor 80, and Waldherr hopes to get his other daughters—Faith, Elishah and Elizabeth—learning on it as well. Waldherr’s teenage son, Noah, is already an experienced rider. Just like his father, he was introduced to the sport at a young age. Since then, Noah has graduated from a Baja 90 to the Arctic Cat DVX 300. 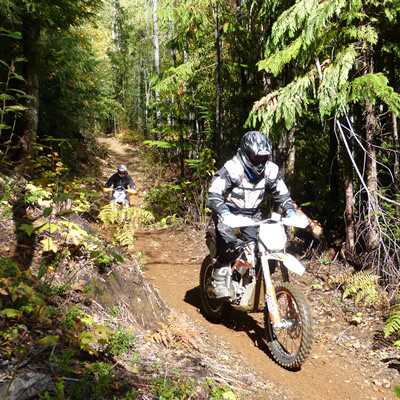 For Waldherr, the benefits of ATVing are twofold. Although Sask Trail Riders is still in its infancy, Waldherr is hoping to create a website where he can offer several GPS maps that other riders can download and use to plan their own adventures. “I think that would be great for riders like myself, as well as for Saskatchewan’s tourism," he said.